Were you able to guess the details of today’s photo? 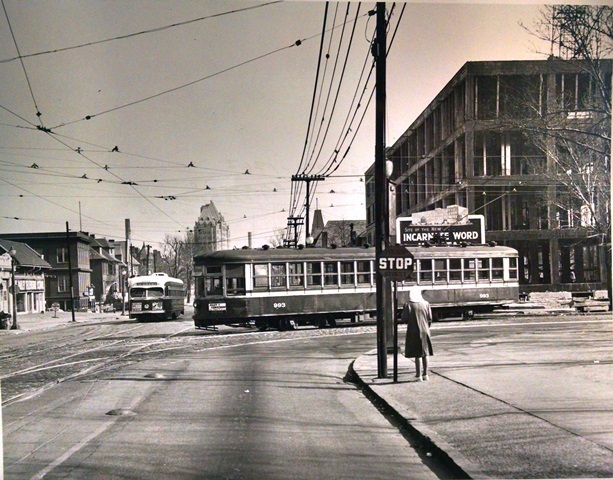 This is Grand at Lafayette looking north on April 16, 1950. Currently, Saint Louis University’s Salus Center fitness and classroom facility. Also nearby, a few blocks south on Grand and Sidney, you might have noticed a rare new construction project on the site of an old gas station. It will become South Grand’s first Starbucks this summer. These buildings and nearby Tower Grove Park can all be reached via the #70 Grand and #8 Bates-Morganford MetroBus. My guess is looking north up Grand from the intersection with Lafayette. The date? Could be late 1949 maybe early 1950? Phil S is correct about the location. That is a 50 Southampton car turning south on Grand from Lafayette, while the motorman on the 70 GRAND car just watches and wishes the Southampton did not get in front of him.